Never has his complete ignorance2 of legal nuance and constitutional education been more on display, however, than it was today in the old Supreme Court room when Stanley made a statement about the destruction of the Ten Commandments monument on the Capitol grounds. Stanley must have mentioned Van Orden 10 times today. According to him, Van Orden stands for the proposition that a Ten Commandments monument is always constitutional on capitol grounds, because “that’s what the United States Supreme Court said” about the monument in Texas. But here’s the rub (and here, not coincidentally, is where Rapert’s argument dies upon a cross of idiocy): The very same day that the U.S. Supreme Court handed down Van Orden, they also handed down a little case called McCreary County v. ACLU of Kentucky, 545 U.S. 844 (2005). No reasonable observer, therefore, could accept the claim that the Counties had cast off the objective so unmistakable in the earlier displays. Nor did the selection of posted material suggest a clear theme that might prevail over evidence of the continuing religious object. For example, it is at least odd in a collection of documents said to be “foundational” to include a patriotic anthem, but to omit the Fourteenth Amendment, the most significant structural provision adopted since the original framing. An observer would probably suspect the Counties of reaching for any way to keep a religious document on the walls of courthouses constitutionally required to embody religious neutrality. So why would Stanley hang his goatee so squarely on Van Orden and neglect to even differentiate his monument from that in McCreary County? Good question! I suspect it is either because he is incapable of understanding legal nuance or (perhaps more likely) because he hopes that his mouth-breathing constituents will believe his inane explanation and will join him in a chorus of “activist judges!” when the monument is ultimately deemed unconstitutional. Almost as an aside, Stanley referenced Sunnum by name as a way to “explain” why his TOTALLY NOT RELIGIOUS, YOU GUYS, I SWEAR! monument was allowable, while a monument from the Satanists or other groups would “never” be allowed at the Capitol EVEN THOUGH, REALLY, HE SWEARS THIS ISN’T A RELIGIOUS THING! To his credit, this was as close as he got to a valid legal point today. Unfortunately for him, Sunnum was not an Establishment Clause case — it was a Free Speech case — so the rationale there is inapposite to a challenge to Stanley’s monument. So, no, Sunnum does not mean much here, at least not as Stanley attempts to spin it. Shocking, I know. More than once today, Stanley referenced a “picture of Moses” over the U.S. Supreme Court bench, and he also claimed that the commandments were “carved right there” in the doors of the Court. These claims are (a) not proof of the constitutionality of the monument at issue and (b) misleading at best. Since 1935, Moses has stood, holding two tablets that reveal portions of the Ten Commandments written in Hebrew, among other lawgivers in the south frieze. 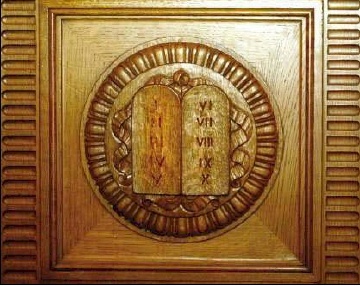 Representations of the Ten Commandments adorn the metal gates lining the north and south sides of the Courtroom as well as the doors leading into the Courtroom. Moses also sits on the exterior east facade of the building holding the Ten Commandments tablets. That is a frieze by sculptor Adolph A. Weinman, which features two male figures–the Majesty of Law and the Power of Government. They are flanked on the left by allegorical figures representing wisdom and on the right by figures representing Justice. Most importantly, the artist himself specifically explained that the tablets in that frieze do NOT represent the Ten Commandments, but, rather, the Bill of Rights. That’s it. Tablets with Roman numerals. There is nothing inherently religious about that — recall, two similar tablets in the east-wall frieze were symbols of the Bill of Rights. More importantly, at least for those of us who like to be pedantic for the sake of humor, Moses (and the Ten Commandments) date to around 1300 BCE; Roman numerals didn’t even exist until 800 to 900 BCE. So these numerals technically CANNOT be a reference to the Ten Commandments. Pedantry aside, for Stanley to pretend like this is similar to the unconstitutional monument he put on the Arkansas Capitol grounds is, like so many of his statements, a maddening lie designed to fool the same type of idiot who would vote for him anyway. Stanley made it a point to mention that there was a legal-defense fund built into the bill that approved the monument, as if the fact that it might not cost the state anything to defend the inevitable lawsuit made the monument constitutional. Simply put, it doesn’t. Whether the monument is constitutional as placed on the grounds8 is a distinct question from whether it would be constitutional for state funds to be involved in a defense of the monument’s constitutionality. This distinction should be obvious to pretty much anyone who gives it more than two seconds of thought, but, then again, I have no proof that Stanley actually did think about it before he spouted off today. So, what do we make of Stanley Jason Rapert’s legal-reasoning performance today? I suppose we chalk it up to more of the same as we try to figure out why this guy continues to get elected. Then, maybe, we assume that applying precedent to facts was not something that was taught in Rapert’s very, very brief stay in law school. Which is to say, at the end of the day, we take a step back and just make fun of him. Oh, sure, he’ll claim that he’s being persecuted, but whatever. He’d do that regardless of our response. Oooh, I know! Let’s contact him and ask him to explain why he thinks Van Orden applies, but McCreary County does not! Or just contact him to ask him why he can pretend to speak with authority about something that he clearly doesn’t understand.